ROSEVILLE, MN - Minnesota’s overall high school graduation rate continues to trend upward, with the class of 2017 posting the highest rate on record at 82.7 percent. While the rate for all students is up nominally from 2016, data released today show the overall graduation rate has increased by 4.3 percentage points since 2012. Over this same time, the number of high school graduates enrolled in developmental education courses at Minnesota colleges and universities during their first two years has dropped by 26 percent, suggesting that more Minnesota students are leaving high school prepared. "I am so proud of the work our teachers, administrators and communities have done to increase the number of Minnesota students graduating, and to reduce the likelihood that a child’s race or ZIP code will predict their outcome," said Education Commissioner Brenda Cassellius. "Most of all, I’m proud of our students. They are better prepared and are less likely to require remedial education." Looking at graduation data over time shows progress in one of the state’s highest educational priorities: reducing disparities between white students, students of color and American Indian students. Since 2012, graduation rates for white students have increased by 3.3 percentage points; rates for non-white students have increased by 11.1 percentage points during that same time. In 2012, white students graduated at a rate 26.5 percentage points higher than their non-white peers. Data released today show that gap has reduced to 18.7 percentage points—a reduction of almost 30 percent. Graduation rates for black students have increased 12.9 percentage points—a 25 percent increase—since 2012. In comparison to their white peers, this represents a nearly 30 percent reduction in the graduation gap for black students over the past five years. Other student groups have also demonstrated significant increases since 2012, shown in the table below. "While our graduation rates have continued to climb and gaps are narrowing, we have too many students who are not receiving a diploma," said Cassellius. "We have so much more work to do to ensure all children have equitable opportunities and receive the support they need in order to graduate on time and ready for life." The graduation data released today include significant changes in the way the data are reported. As a result of new federal reporting requirements, students are now identified using one of seven racial/ethnic groups, instead of the previous five groups, adding categories for students identifying as two or more races, as well as migrant students, and students experiencing homelessness. Additionally, the new data reflect changes to the way graduation rates are calculated. These changes are a part of the state's transition to its approved plan under the new federal Every Student Succeeds Act (ESSA). Examples of the changes include no longer counting foreign exchange students in a school’s rate, and counting students who drop out at the high school where they spent the majority of their academic career. The Minnesota Department of Education has recalculated graduation rates going back to 2012, to allow for an accurate look at trends over time. Because of the new method of calculation, previous data reported cannot be compared to these new figures. An FAQ about the changes is available on the department’s website. Minnesota has set an ambitious goal for its four-year graduation rates in the state’s ESSA plan. By 2020, 90 percent of Minnesota students will graduate in four years, and no single student group’s graduation rate will be below 85 percent. This goal reflects the state’s strong commitment to equity and ensuring every Minnesota student receives a high school diploma, and is bolstered by the state’s plan to identify for support any public high school with a four-year graduation rate below 67 percent overall, or for any student group. "Beginning this year, we will identify any high school—whether or not they receive Title I funding—for intervention and support if they demonstrate low graduation rates," said Cassellius. "They will receive support from our nationally recognized Regional Centers of Excellence in order to address the unique issues facing that school. This is a huge step forward in our efforts to address equitable outcomes for our high school students." 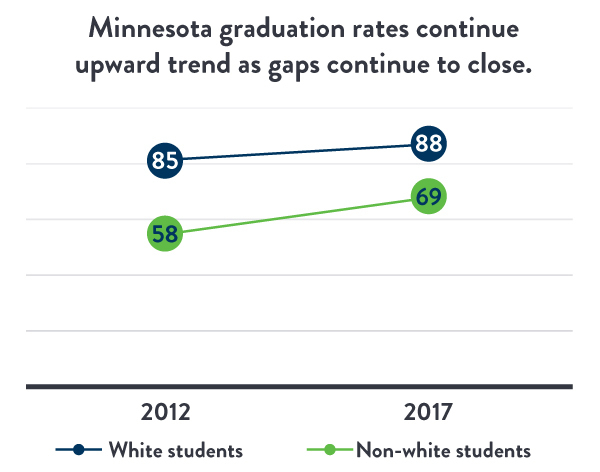 Graduation data are available on the Minnesota Report Card, presented in an easy-to-read, mobile-friendly layout that includes charts and graphs illustrating trends and results for all student groups. View the complete statewide, district, school and county graduation rates in an Excel spreadsheet by visiting our Data Center. Under Category, select Graduation Rate and click List files to access graduation indicator files for each year. View data on enrollment in developmental education in Minnesota colleges and universities on the Minnesota Statewide Longitudinal Education Data System (SLEDS).